I thought it was time to take a few new photos of our bathrooms. 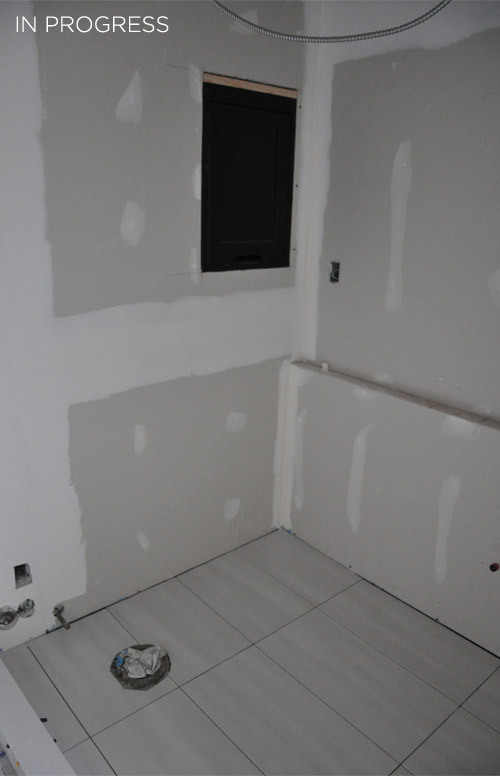 This post will just be about the downstairs bathroom, look out for a post about the upstairs bathroom soon! Even though our renovation was over a year ago, things are still not perfect, but the renovation is done and it’s generally pretty, I just keep fussing over accessories (although I’ll like fuss about that stuff my whole life haha). Also, the fact that I REALLY want to replace the light fixture. We put in a cheap Ikea fixture as soon as the reno was done, it was meant to be replaced eventually, but I just haven’t found the right fixture for the space. Check out the transformation below, it’s pretty awesome too look back on it, I can’t believe the walls used to be mustard yellow and the floors were blue! Also, the closet is the major change for us, sliding doors and shelves inside! 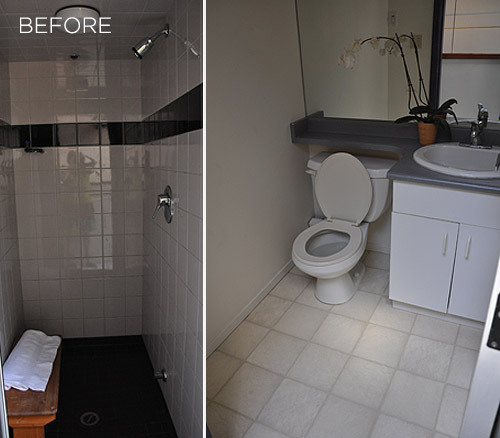 Oh and if you missed the previous posts about this bathroom check them out here and here. The upstairs bathroom is finally finished! 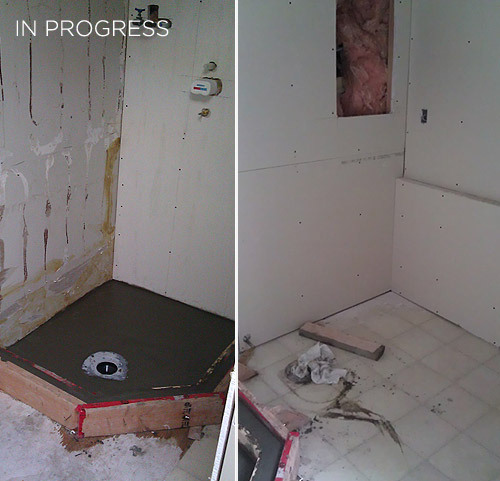 Although these photos are not really up to date, they don’t include what we ended up doing with the corner shelf in the shower to cover the pipe. I’ll probably do a single post about this to explain in detail what we did to avoid cutting into the main water line and moving it. I previously posted about the progress of this room, but a lot has changed since then. The bathroom took a while to finish because we were waiting for our counter top to arrive. We got a reclaimed piece of fir that was hand finished, it really looks more beautiful in person, it’s very smooth and the cracks and knots have been filled with epoxy, so you can see right into the wood. I was initially scared about getting water on it, but so far so good, it just beads right off, but I still wipe it regularly. Someday we’ll probably change the light fixture, which was so cheap at IKEA. We just needed something urgently, so we went with it. It’s not the most attractive thing, with the black base that sticks out on the wall, but it does the trick for now. The upstairs bathroom is a bit of a nightmare. The previous tenants installed a steam shower where a closet once existed. in this closet there was the water heater and some electrical as well as 2 sprinklers and the water shut off for the suite. 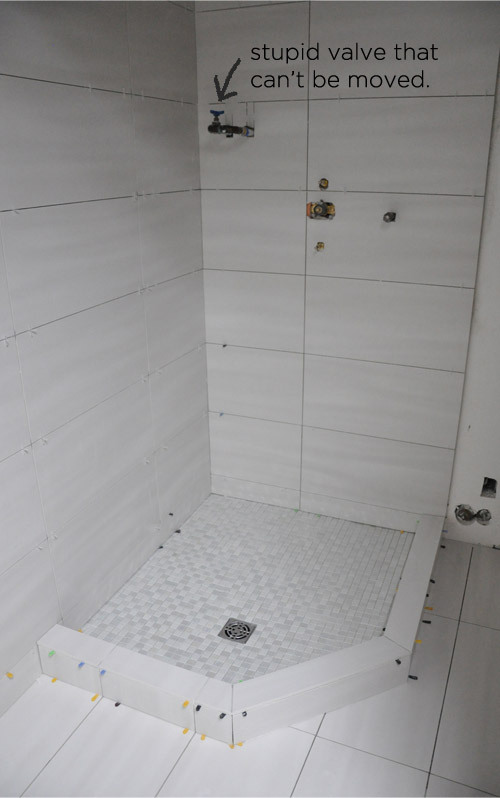 We took down the dividing wall between the toilet and the steam shower to create a full bathroom. Unfortunately we aren’t able to move the sprinklers or the water shut off valve, so we’ll have to work around it. If we did move them, we’d have to discuss it with our strata council wait for approval from the board, this is definitely not an option on our tight schedule. Our solution is to build a shelf around the water shut off value that will disguise it. Our plumber created a second water shut off near the water heater, which was moved into the bedroom closet, so we won’t really need to access the valve in the shower. The sprinklers will also be staying, but they’ll be hidden in the ceiling. We’re doing a fir slatted ceiling instead of drywall. It’s actually cheaper in terms of labour costs to do this and it’ll give the room a sauna feeling. The shelf to disguise the shut off valve will be made of corian or plexi glass and will fit nicely in the corner to hold our shampoo etc.